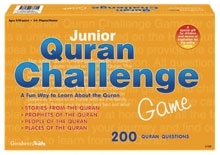 The Junior Quran Challenge Game is a board game for children ages 5 – 10 years. It is a game that requires the players (2-4 players or two teams) to answer questions about the prophets and messengers, Islam and stories mentioned in the Qur’an. The 200 questions cater for children with different knowledge backgrounds. As such, the questions are challenging but not too difficult; a few questions are easy. The questions are arranged in four categories: Stories from the Quran, Prophets of the Quran, People of the Quran and Places of the Quran. Taking turns players move one space on the board (there is no dice), starting at the camel. Players select cards, read the questions from the category indicated on the space he lands on and if s/he knows, gives the answer to it. Special ‘circular landmarks’ on the board allows a player to select a question from any category and move forward to spaces if answered correctly. The player who reaches the finish first is the winner. Overall, I thought the game was well designed, however, the question and answer cards could have been made of a sturdier material to withstand the wear and tear of young hands (remember this is the junior version of the game). The game will add some fun while reinforcing lessons taught in Islamic studies. It can be played at home or in the classroom (team play here can add more excitement). The game components are: game board, 4 pawns, 50 questions and answer cards.